As the New Year starts Carol & Jim are now working at (APRE) Atlantic & Pacific Real Estate (CA) Inc. We have completed over 40 classes on assisting sellers on distressed properties along with learning the online systems at APRE. Distressed properties are now a major part of the market. The name has changed but we are still doing the same things we have always done except we have added distressed and corporate owned properties to our list. We still have the moving van for our clients and charities to use. The good news is we will be sending out email blasts with the homes that will be for sale once the sales price is determined. If you are an investor or a first time buyers it’s a great time to buy. No matter how bad the housing market has been. I have never lost $80,000 on a house in one day. Unfortunately a number of my friends did just that lost over $80,000 in one day. Now I know that’s unusual and if you leave your portfolio along it will probably come back over the long term if you were invested in good companies. Buying a home now is a wise decision. The stock market is going to be volatile for some time and home interest rates have not been this low since the 70's. There was an excellent article in "Smart Money" by Jillian Mincer, "Forget the Market. Buy A Home". We all need somewhere to live and at these interest rates if you have money buy now. Pay the home off as soon as possible if you can afford a 15 year loan due it even better a 10 year loan. If not, that’s ok too. It’s been a long time since anyone has built any executive homes in Brea. Standard Pacific is building 38 elegant residences at one of the highest locations in Brea with some homes having views of the Pacific Ocean and Catalina. Homes are open daily for viewing now. There are 3 models Mirada, Seville, Valencia, ranging in size from 4,200-5000, 4 - 5 bedrooms, 4 - 5.5 baths, 3 car garages. There will only be 38 homes built at Castillian at Blackstone. Just West of the 57 freeway at Lambert Road, Turn Right on State College and follow the signs. There are 3 other new tracts of homes for sale that have opened recently in Brea. I will add information on these tracts in a few days. Paul Baran dies at 84 and you shoud care! Without him I would not be able to publish this blog, send emails, or anything else we sent through the internet. At the Rand corporation he created the "packet switching network", which is what allows the grouping together of information into packets that can be easily sent across the internet. He died March 26, 2011 of lung cancer. This man has had a impact on almost everyone in the world and very few know him. There very few of us who will ever be able to say I made a difference in the world. Take a moment to read about Paul in Digital Trends, or google his name there is plenty of information there. He is worthy of your time. Not everything is about real estate. Carol and I enjoy our classic cars and Kodi, our Samoyed loves to go everywhere with me. When he rides in the convertible he has to wear his "doggles". At first he didn't like the doggles until he realized the wind wasn't blowing in his eyes. Everyone goes crazy when they see Kodi in the car and start taking pictures. I can't count how many times we are out and about town and someone jumps out of their car to take a picture of Kodi. Kodi thinks he's pretty cool too in his doggles. 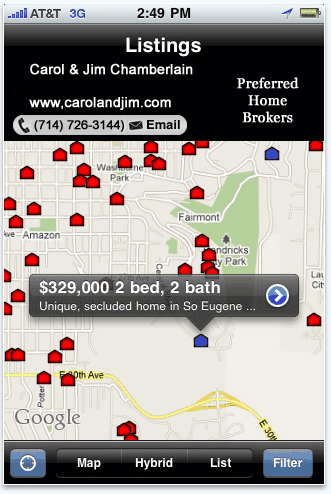 Best iPhone House Hunting App Ever! My Agent is the best iPhone app for house hunting I have ever used. Go anywhere click on the My Agent App and what you see is all the properties listed for sale all around you. Click on any of the houses and you can find what the price is and the bedroom and bath count. Click on the arrow in the same box and it opens up the picture of the house, Description, and more photos. Slide the map in any direction and more homes will show up. There is even a filter to adjust the minimum and maximum price, number of bedrooms, number of baths, and even the square footage. Fast, easy to use, and it’s free. After you download the free app (My Agent by IDX) from the App Store you will have input a 4 digit password (4693) one time to be able to use the app. No, I have not used this app all over the country but I have used in Orange and Los Angeles Counties. Carol has found it very useful when showing property to buyers. There may be another home close by one Carol has picked to show and the buyers want to know why she isn’t showing them the house down the street. All she does is open up My Agent “Refresh the Map” and click on the house in question and she can show the buyer the house didn’t have enough bedrooms, or baths, or square footage was below the minimum they wanted. When you’re driving around and see a new sign up in a neighborhood you can find out all the information quickly using My Agent. If your house hunting this is a must have app! 1. Mortgage rates are at an all time low when buyers take advantage of today rates they start building equity right away. You can handle a few up and downs as market gains momentum. Just a few years ago buyers would have jumped at chance to have a 6% interest rate on a home purchase. Today the rates are around 4.5%. Here's the best part on the purchase of a $300,000 home you will save over $102,000 of the life of a 30 year loan. Thats right over a $102,000 over the loan or $3,400.00 a year. 2. There are lots programs to help the first time buyer and middle-class families to buy home. Add one of these programs with today’s current low interest rates you can save even more cash. 3. Fannie Mae guidelines in the past have tied the appraiser’s hands on how they could value a home. These guidelines were so strict it made it difficult for an appraiser to give a fair and honest appraisal. Appraisers, now, can more accurately reflect the current values in their given markets with the changes made in the updated Fannie Mae guidelines. 4. Home owners have continued to maintain their homes and spend money on repairs and improvements. When these homes come up for sale they are much more desirable that the tired old foreclosed homes (REO’s) saving buyers thousands of dollars in repairs. Printable Coupons to Save MONEY 2! Saving Money with coupons is always a good thing especially when you're buying the products anyway. Wow, did I miss one of the best coupon sites on the web. CouponChef.com. For the names of the other money saving coupon sites you can go to our previous post by clicking here or use this link http://www.northorangecountyrealestatesales.com/Blog/Printable-Coupons-to-Save-Money. Another month has closed and my wife has saved a total of $293.25 for the first 3 months of the year. In recent months there have been 2 devastating earthquakes in the world. One earthquake was in the island country of Haiti and now another in Chili in the last 6 months. The potential for a tsunami was very real around the Hawaiian Islands, Japan, and the California coast to name a few areas. Take a moment and go to daretoprepare.org and you will find lots of information on earthquakes, earthquake safety, and helpful tips. The IRS has clarified what documentation is needed to claim your first time buyers and move-up buyers tax credit. You are still required to fill out a 5405 form but is NOT requiring all buyers and sellers to sign the HUD-1 settlement statement. If you live in an area where it isn't common for the all parties to sign the HUD-1 its OK. The IRS says: " in areas where signatures are not required on the settlement document, the IRS has clarified that it will accept a settlement statement if it is completed and valid according to local law. The IRS encourages those buyers to sign the settlement statement prior to attaching it to the tax return." So if you live in Southern California where it’s uncommon for buyers and sellers to sign the HUD-1 make sure you the buyer(s) sign your HUD-1 statement before mailing it in with your tax return. If you are a move up buyer or repeat buyer, the IRS is requiring documentation that proves you lived in your last home 5 of the last 8 years. Items the IRS will consider as proof are: tax records, mortgage interest statements, and home owner’s insurance records.